Coral Reefs: an overview - COR(AL)OHA -- Chris B. Wall, M.Sc. Coral reefs are ecosystems of immense biodiversity. Reef corals are very unique animals that from symbiotic relationships with microbes and unicellular algae--called 'zooxanthlellae'. Corals and their zooxanthellae are integral to coral reef ecosystems by providing habitat for a myriad of reef-dwelling organisms through the construction of massive calcified skeletal structures. In the nutrient poor, clear (i.e., high degree of light penetration in seawater), and warm (~ 20 - 29 °C) tropical oceans (~ 30° N/S latitude) reef corals thrive; these conditions favor zooxanthellae photosynthesis, coral growth and calcification, and allow corals to out grow their competitors: fast growing macroalgae. 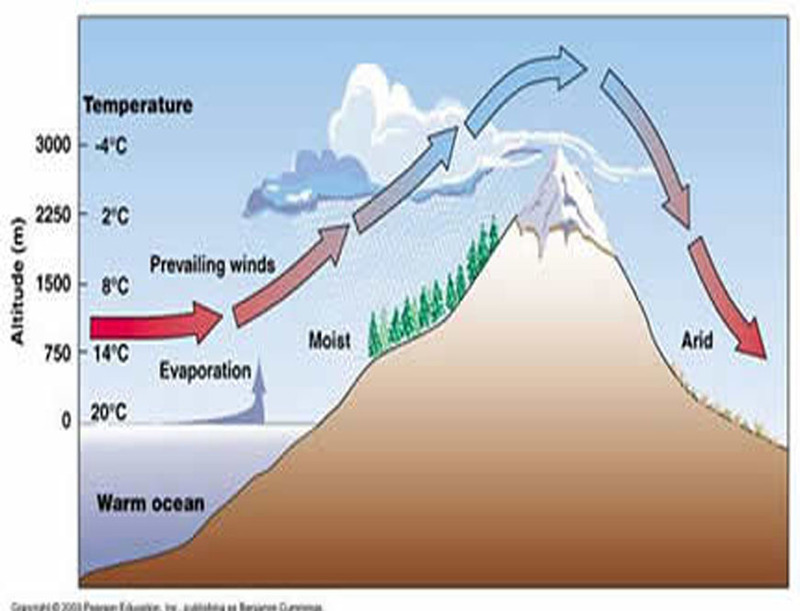 However, the dominance of corals on a reef can be affected by natural events such as wave energy and storm events, terrestrial runoff from rivers and streams, and numerous environmental factors including changes in salinity, temperature, and light. ​The ability to tolerate changing, and at times stressful, environmental conditions affect the distribution and prevalence of reef corals worldwide. ​​​The connection of land and sea: "Mauka to makai"
The Hawaiian archipelago sits in the middle of the Pacific Ocean and the Trade Winds (blowing from north-east to south-west) bring cool air and moisture off the ocean towards the islands. This moisture hits the windward (east/northeast) side of the islands and contributes to cloud formation and rain. 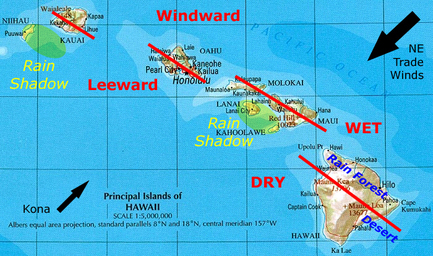 In contrast, the leeward side (west/south-west) receives less of the moisture laden trade wind air, partially because a large portion of the moisture was deposited on the windward side of the islands. This process, known as a rainshadow effect, is active here in Hawai‘i as well as in other coastal, mountainous regions of the world such as California. Rainfall can cause erosion and will wash debris from the land--everything from the mountains, valleys, stream beds, farmland, and your driveway--into the ocean, or mauka (mountains) to makai (the sea). In this way, the land and the ocean are integrally connected. In total, greater rainfall contributes to more coastal runoff, sedimentation, and nutrients delivered to the ocean, and these inputs can have ecological effects on coral reefs and the stony reef corals. We acknowledged that rainfall can affect the land, its climate, and terrestrial organisms, but what about life in the sea? Q: Does island geography affect water quality on coral reefs and reef-dwelling organisms such as corals? 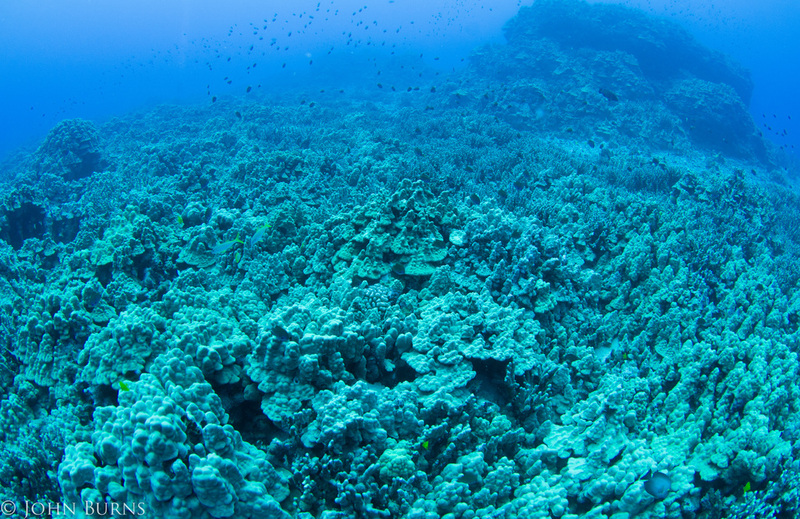 Q: What differences are there among windward and leeward coral reef ecosystems? Hilo vs. Kailua-Kona: A contrast of "windward and leeward"
Fig. 3. Leeward and windward sides of the Hawaiian Islands. 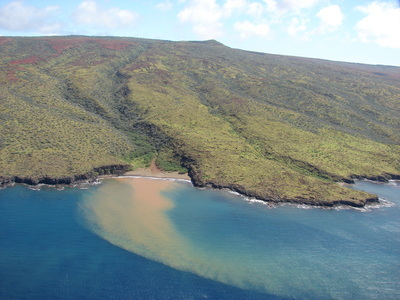 Hawai‘i Island (also known as 'Big Island') serves as a great example to contrast windward and leeward coral reefs. Hilo town is on the windward side of Hawai‘i island and receives in excess of 160 inches of rain a year! Hilo is lush and verdant with numerous rivers and rich agricultural lands. 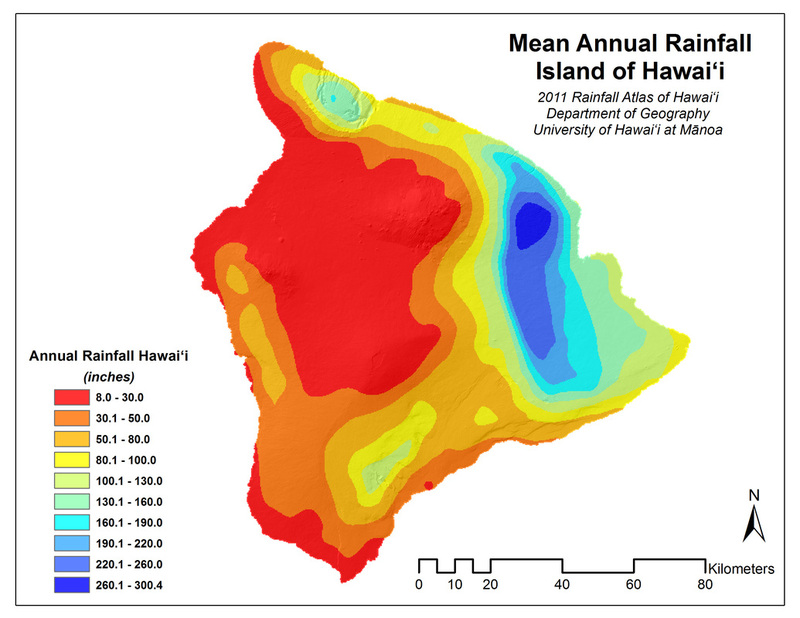 In contrast, the leeward region of Hawai‘i island, specifically the moku (or district) of Kailua-Kona is hot and dry (ideal for growing coffee) and received only ~12 inches of annual rainfall. ​ These two areas (Hilo town and Kailua-Kona) are on the same island, yet their climates share very little in common. This difference is to due to the large volcanoes (dormant and active) that span the island, which act to obstruct and collect moisture, therefore creating drastically different conditions across the island (windward vs. leeward). ​Using 'Windyty' (to the left) you can actually see the path of the winds (and other metrics) across the globe in real time! Notice the Trade Winds out of the northeast. 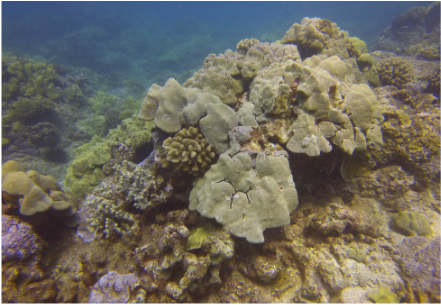 ​We've set out to look for differences in coral reefs based on location (side of the island) that we hypothesize to be attributed to rainfall, land-based nutrients/sediments delivered from streams and rivers, and other factors such as storms/waves. Coral reefs are also affected by water clarity and light availability, and increased runoff makes the water cloudy, full of sediment and nutrients (akin to fertilizer) and reduce the availability of light, which fuels photosynthesis in the coral's symbionts. ​As we go deeper into the ocean light will decrease and this decrease in available light will be affected by how clear or "not-clear" (i.e., turbid) the water is. So let's test a second round of hypotheses: coral communities will show visible differences as we descend deeper into the ocean, and this visible change will be greatest where water quality is poor. Now that we've learned about reefs, we've made observations about differences in climate and environmental conditions that may affect coral reefs, and we've defined our hypotheses, let's get in the water! !